What about 2 year old energy? One of my friends - a teacher of 2 year olds - recently asked me, exhaustedly, what to do about a little 28 month old child in her class who couldn't keep his hands to himself. He's a busy, busy, busy little guy in a small physical space with nine children. When he gets too close to classmates, he swats at them, moves them out of his way, and continues bustling by. "What would you do with this little guy, Maureen?" Well, she posed that question wrong! I answered with my Mom voice, not my teacher voice - "What would I do? Oh, I'd throw him into my jogging stroller and we'd go down to Sligo Creek; after I finished a quick run, I'd let him out to explore the creek. We'd pick up rocks and toss them in the water, we'd look for bugs and ducks. There are beautiful herons nesting there now - we'd have to check those out!" Because my friend is responsible for nine children - not just one child - my response was not really helpful. But, I believe the underlying message is important - we need to be aware of how we define "educational" success with two year old children. Two year olds - think about it - they are really, really young! We're talking 24 -36 months of age only. And two year olds have the added developmental stage of being "all about me" - meaning, the concept of sharing and playing WITH others is simply not present. They are not only new to sharing - it's another language that their brains aren't yet open to learning. 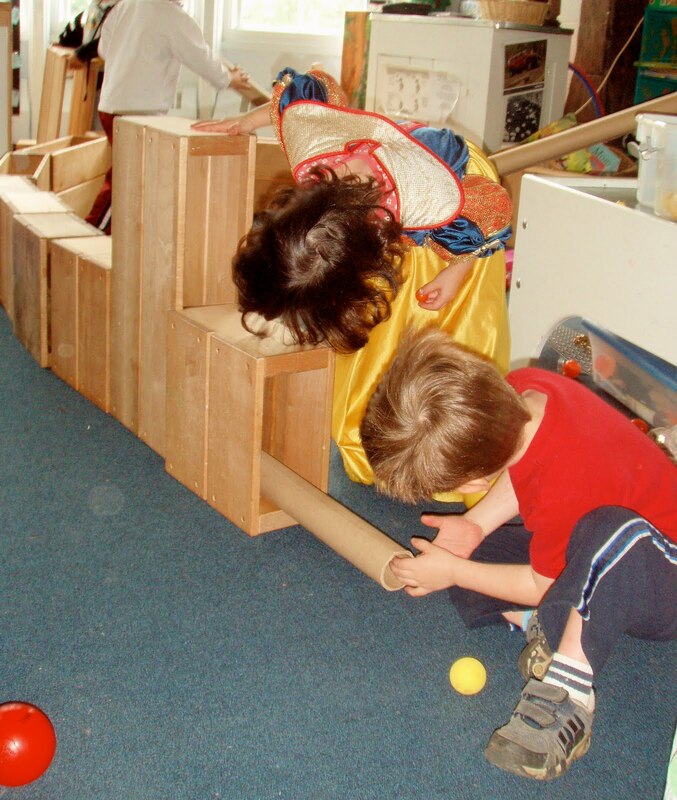 Teachers of twos work with a range of abilities and personalities - the "running roughshods" to the "lap sitters" - and this range of children play parallel to one another not together. Teachers of "running roughshods", or "frisky" two year olds, are forced to stretch themselves to find ways to keep everyone safe and happy. 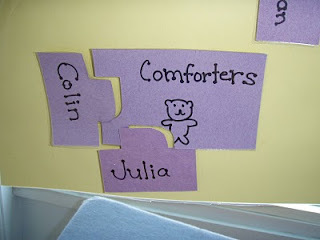 These teachers find ways to shadow these little ones a little more closely, to spread out the adult staff in their room so that there are many hands and eyes. Helping children feel safe and happy among others, and, therefore, cultivating the very first seeds of love of learning. It is NOT about the ABCs. The ideal two year old classroom is large enough for children to explore and play individually, on their own. 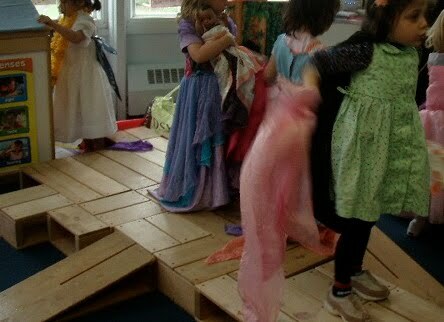 Additionally, the ideal classroom has a very small child to adult ratio - providing enough loving adult presence to softly remind, guide and model correct behavior, and has non-pressured "circle times" that provide a positive opportunity to learn how to gather and work together - to be a community. 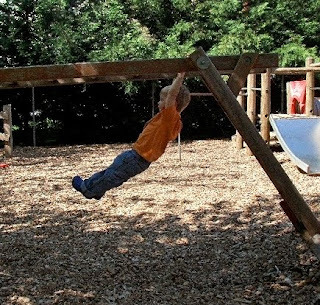 - Plenty of outside play that lets you run, stretch, jump, and swing at your own pace. the ability to choose your own fun, with a loving adult following your lead. And teachers who provide these busy little folks with a happy and safe environment should know their job is well done! This morning as I went out for a jog, I was sad to see a rabbit dead in the road, run over by a car. Next to the rabbit, sitting right on the curb, some three feet away, was another rabbit...perhaps his partner, certainly his friend...present, near, sitting with the dead rabbit. I was moved to tears. I walked respectfully by, thinking, "Wow, even our dear little animal friends have empathy. Feel pain for others. Feel loss." I believe we are all born with empathy, with the possibility of being empathic. I also wonder if there is a window in which, developmentally, this trait must be "solidified" in order to be intrinsic to one's being, in order to be lived out rather than stifled or shut out. If there is such a window, I am certain it is the early childhood years. I have met (and heard about) many people that seem to not be empathic. Pick up a newspaper and read the stories and you will see lots of ugly behavior - defensive, self-focused, embittered, detached, uncaring, bullying. 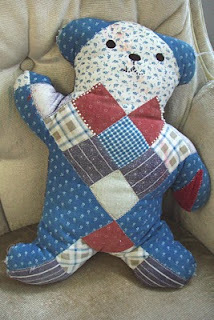 Parents and teachers of preschoolers often ask me - Why does he hit everyone? Why does she boss her friends around? Is he a bully? How can I stop her from being a bully? 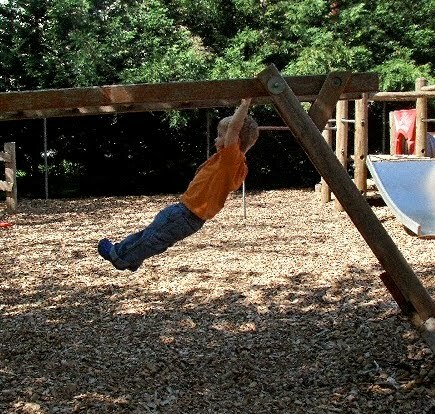 At a training workshop last fall, one teacher surmised about her 4 year old student's frustrating behavior - "he's just trying to get my goat, looking for attention." I'm sorry, but I just do not accept that kind of negative thinking. I think it is our job as educators and parents to teach empathy, to provide a positive learning environment where children's feelings can be explored and self-regulation and understanding can begin. How do we ensure that our children will grow with softer hearts? How do we teach this, early on? 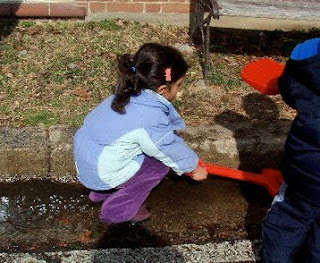 Simply put, our home lives and childcare programs must demonstrate and reflect empathy. Teaching a child to be empathic will be easy and painless if they are surrounded with an empathic world - with loved ones who reach out to help those in need, modeling the appropriate way; with adults who speak kindly and with understanding, encouraging and laying the groundwork for children to get along together; with parents and caregivers who don't get angry, defensive, and presumptuous when a child misbehaves, but who stay calm while setting higher expectations for how behavior should be. At that wonderful "Friendship Skills" training I attended back in March (see my 24 March 2010 blog post ), Phil Strain noted that one of the most important qualities in any friendship is "reciprocity" - the ability to give to others when you aren't necessarily getting something in return...you have trust in your relationship, you know there is mutual give and take. Phil Strain noted what a difficult concept this is to get across to young children. Realistically, you don't tackle this as a one-time subject unit - "Today, children, we are going to learn about empathy." Instead, learning opportunities must be woven into the day, day in, day out. "Everyone is safe and loved here." "It is our tradition to show kindness and respect with one another." "We are gentle with our hands. We are kind to others." "It's not our tradition to yell." "Let's hear what she has to say. It is right to listen to others and hear what they are thinking." 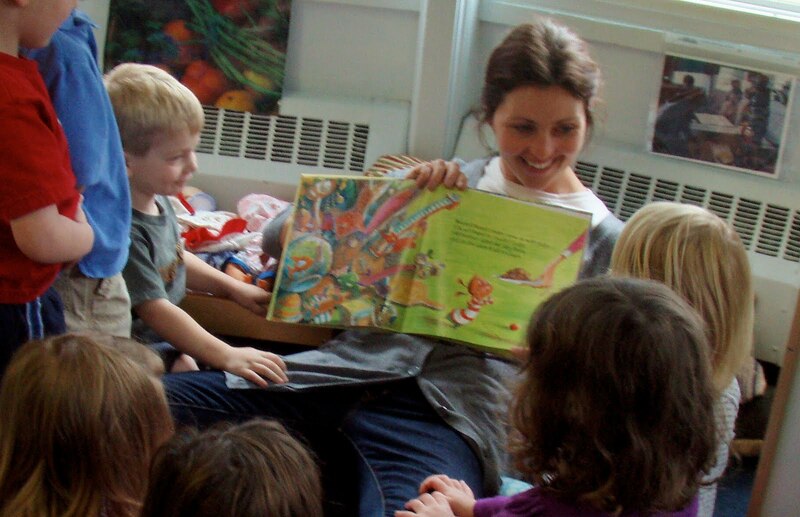 - When I read storybooks, I often ask the children what they think other characters are feeling - much like Jon Sciezka's The True Story of the Three Little Pigs by A. Wolf. These can be wonderful lunch time and circle time discussions - what do you think Mommy Owl was thinking when she was gone from her Owl Babies? Or, how do you think Daddy felt when he couldn't understand what his daughter Trixie wanted in Knuffle Bunny? 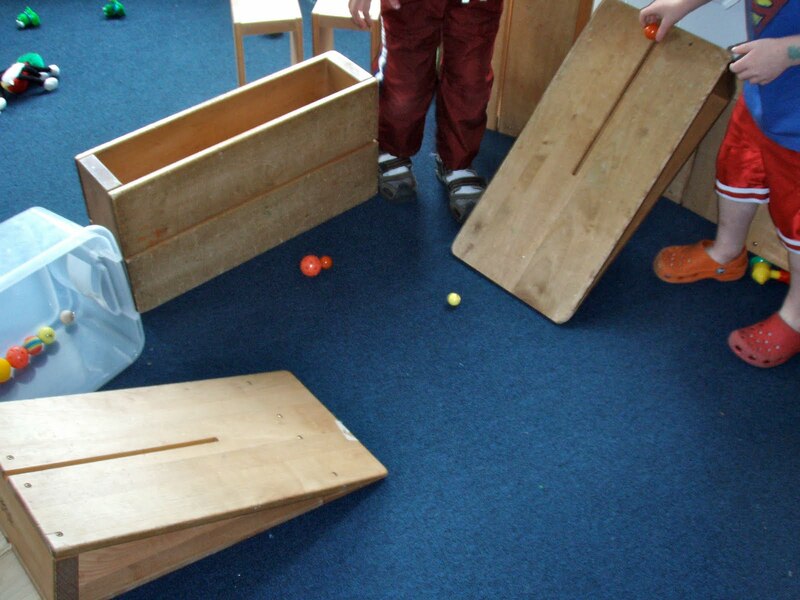 The goal here is to stretch children to consider another perspective. - Perhaps most importantly, simply gather together with the children in your class or with your family...develop rituals and opportunities for loving, caring exchanges together. Let children see and hear what others are thinking, feeling, hoping, and believing - and to become part of their community. These ideas are really too few in number. 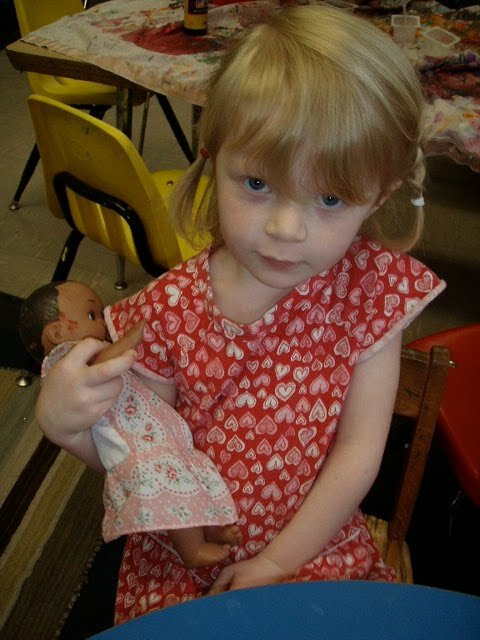 There are so many more things we adults could do to introduce empathy to children. As with all things early childhood, there is no easy, one-step answer...helping a child be empathic takes time and focus. What are some other ideas? I'd love to hear from you. This is a topic worth exploring further. The end of another school year, the end of a chapter for me. 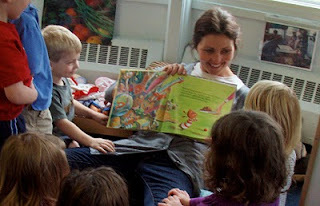 My last day at Silver Spring Day School, where I have taught for some 10 years now, was Friday, June 11th. I am not returning next year. It was a very difficult decision, to leave work that I enjoy and where I feel loved. But, I'm feeling called to do more writing and training in early childhood, and I needed more flexibility in my work week. 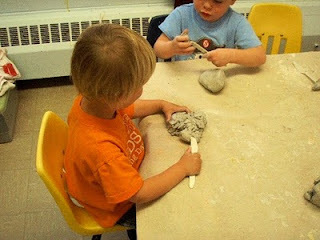 I am considering a variety of early childhood possibilities, including going back to school. I am not at all certain what I'll be doing this fall, but without a doubt I will be working with young children. I have been so touched by the outpouring of affection and appreciation from the families at my school. They surprised me with a gorgeous necklace, a bead necklace - and each of the beads was chosen by a different family. I must share this necklace with you! I am awed by the variety of the beads, their shapes, colors, and designs - flat, round, oblong; flowers, animals, hearts; transparent, striped, spiraled; on and on. I am so aware of the parallels to children and their parents - so many different people in this world! So many different ways to be. And, it all adds up to one beautiful mix. The necklace makes me feel happy, just like my preschool classes always do! What about teaching conflict resolution? No blog entry today...I simply wanted to spotlight an uplifting article in today's Washington Post entitled "At Peace Parade in Mount Rainier, students line up to celebrate staying in line," by Lonnae O'Neal Parker. What a delight to read about an elementary school program that is intentionally teaching children conflict resolution skills! We need to take the time to teach children how to be peaceful. Too often, we are reacting to inappropriate behavior, rather than providing a strong foundation of kindness and respect. We can set the expectation of how to treat one another appropriately. We can show children how to do this. What a worthwhile goal of education! What about the block corner? Let's see if I can share a photo essay with you! The past few days, I have been pouring through photographs as I prepare individual photo albums for my children. This is my yearly gift to families, a ritual I always enjoy. It is always surprising and endearing to see how much the children have grown during the year - to see how their play has matured from parallel, alongside one another to full-blown, cooperative large group fun. It is obvious in the pictures. This year, I am stunned by the metamorphosis of the block corner. I love my large blocks! 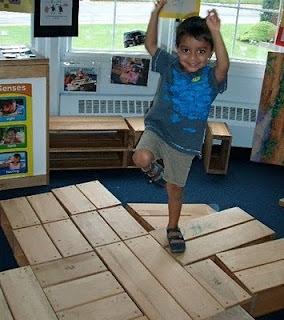 I convinced my director to purchase a wonderful set of Community Playthings hollow blocks for my classroom several years back. 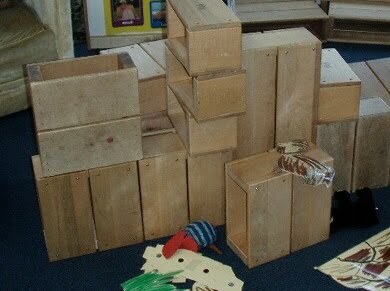 There are so many wonderful attributes to the blocks. 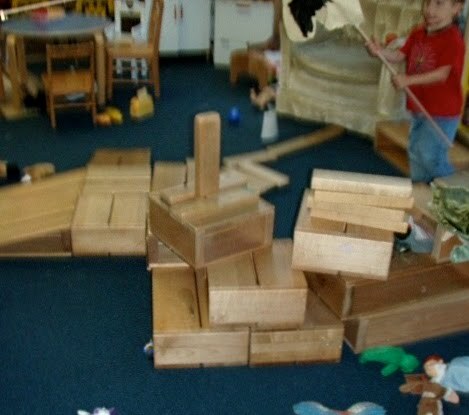 Children are instinctively so creative; I love watching the "no rules" open-ended building. 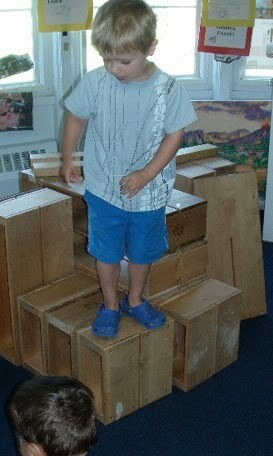 Large blocks are a great way for small children to "center themselves" by lifting larger, heavy things. 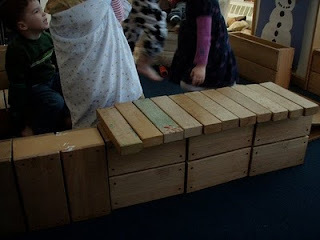 Plus, this corner of the room becomes a very social place - the children must negotiate about what and how to build, they must use their imaginations together. These photos just give a hint at the play...the children have made the block corner come alive, building castles, boats, animal homes, bridges, ramps, forts, and even dance floors. 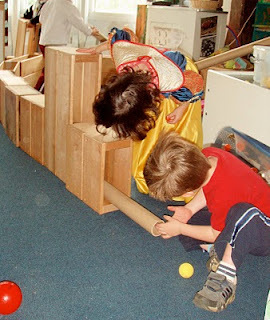 The play has been extended through use of so many different materials including other blocks, pillows, animals, scarves, dolls, legos, and balls. Yes, the block corner is my favorite place!